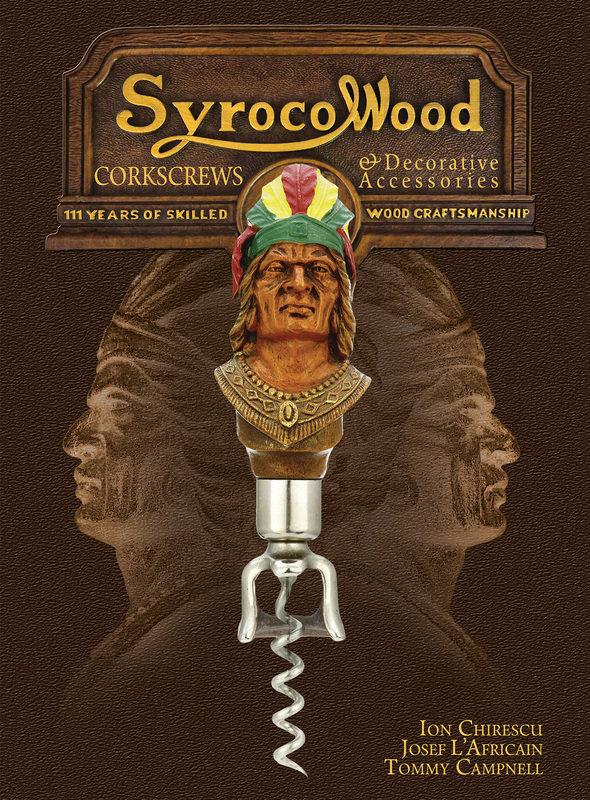 SyrocoWood Corksrews and Decorative Accesories has just been completed. 330+ pages of Syroco History and Syroco Corkscrews. We will be publishing copies starting in March. If you are interested, drop me a line! 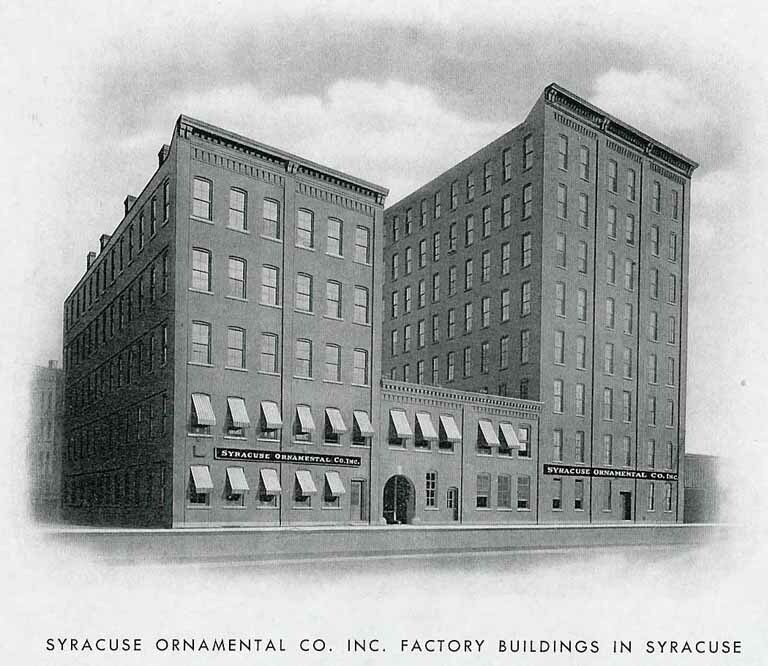 The SYRACUSE ORNAMENTAL COMPANY, also known as SYROCO, was founded in the late 1890's by an Austrian woodcarver named Adolph Holstein. Initially the company produced ornamental carvings for the embellishment of coffins and furniture as well as the interiors of fashionable homes, including the New York Governor's mansion in Albany. As demand increased, a molding technique was developed where Syroco could create perfect replicas of their original carvings. These molds also featured a wood grain within the mold, allowing for a more detailed aesthetic. The recipe of wood flour, waxes, and resins combined with compression molding created an inexpensive, but high quality product. As the 40's approached, demand for Syroco was waning with the new popularity of Danish Modern with its clean simple lines and less ornamentation on furniture. Novelty items became a new venture for the company; focusing on house wares, barware, and items for the smoker, as well as other offerings. Syroco literature suggests that this was not a profitable time for Syroco, yet it allowed the company to survive into the 1950's. During the 1950's, Syroco started to change directions again. And, while novelty items still appear in their catalogs of the time. Highly stylized wall mirrors, sconces, and decorations became the company's focus. This may seem like the beginning of the end of corkscrew production for Syroco. And, of course, ultimately it was. 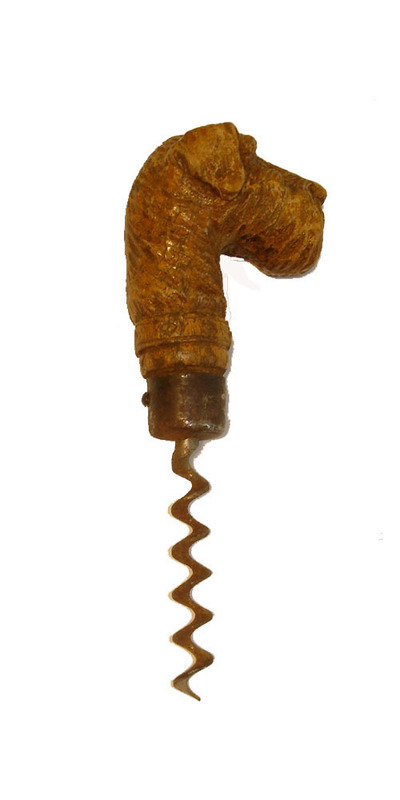 However, in Syroco catalogs corkscrews can still be found into the mid-50's. In 1953, Syroco introduced a process for obtaining the finish on these seemingly gilted home accesories, called "metalgold"; a process, as the catalog states, "...wherein real metal is deposited on the object and toned and shaded by skilled hand operations." 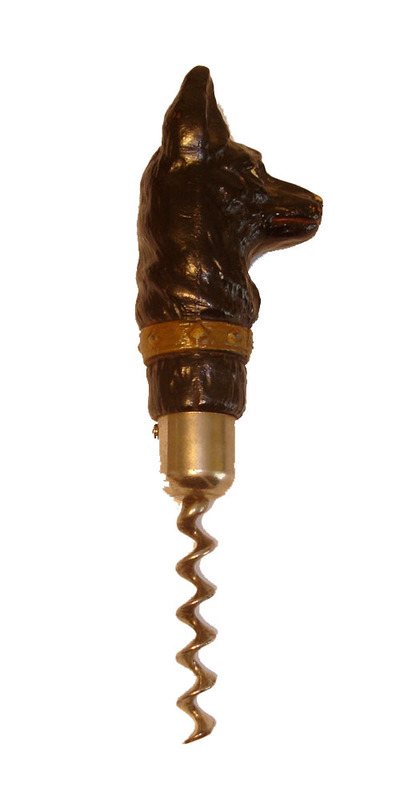 This could explain the introduction of the Golden Knight corkscrew which has a similar finish--although perhaps he would be more aptly called the metalgolden knight. I have yet to find a reference to said Golden Knight in any syroco catalog, but I have, over the years, owned three of these pieces and all have the Syroco sticker. The sticker is different than found on other items however, as it references three showrooms (New York, Chicago, and Los Angeles) early stickers have no reference to showrooms, and the 1950 catalog mentions the third showroom in Los Angeles. This would lead me to believe that the Knight is post 1953, whereas the others were introduced in the 40's. The earliest reference I have been able to find for these pieces is in a Syroco catalog from 1940...pieces continue to appear in catalogs in 1947, and 1955. 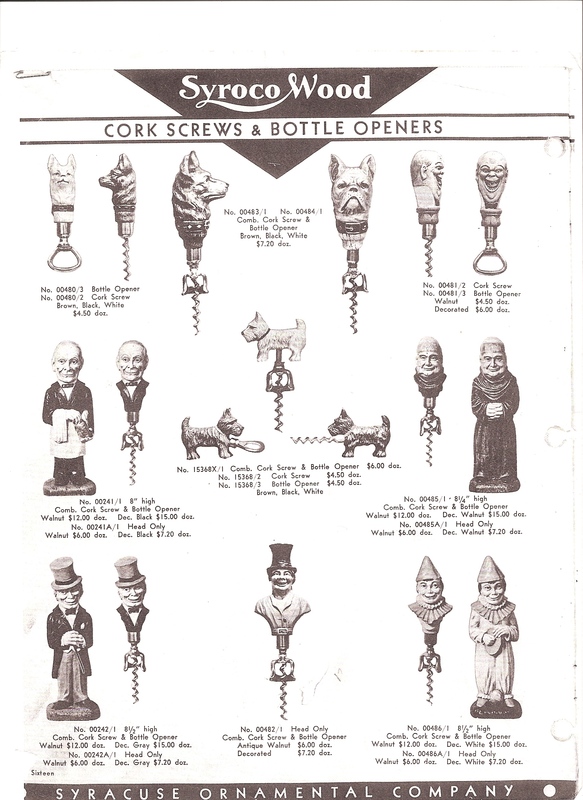 However none of the catalogs that I have seen picture all the corkscrews that Syroco made. Labels that are affixed vary which, as previously mentioned, may offer some dating. 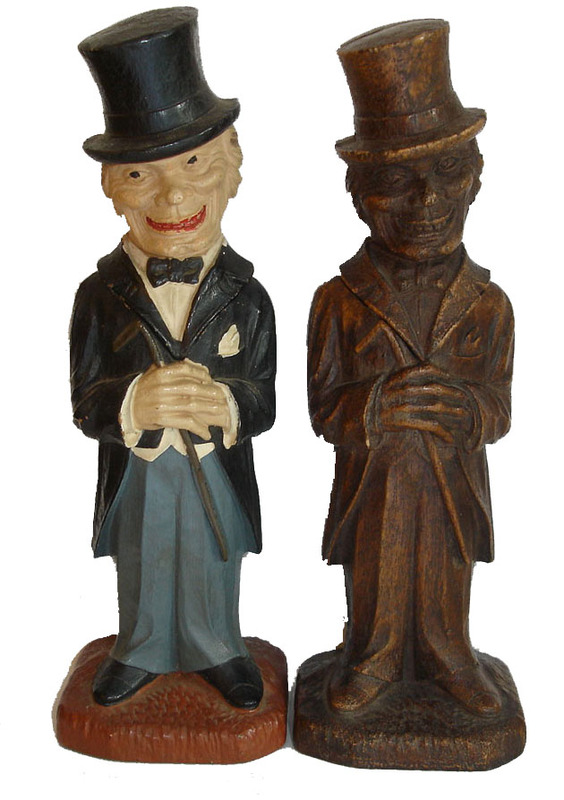 For example, early waiter and codger pieces say SYROCO, while other pieces read SYROCOWOOD. Other stickers have shown SYROCO New York, SYROCO New York and Chicago, while others added Los Angeles to their name plate. Other variations also appear. 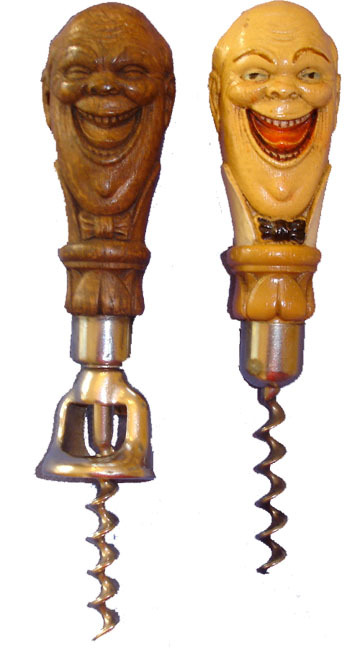 Oftentimes the Clown or Monk corkscrews appear with a sticker which reads "KING." Both the monk and clown, however, are pictured in Syroco catalogs. 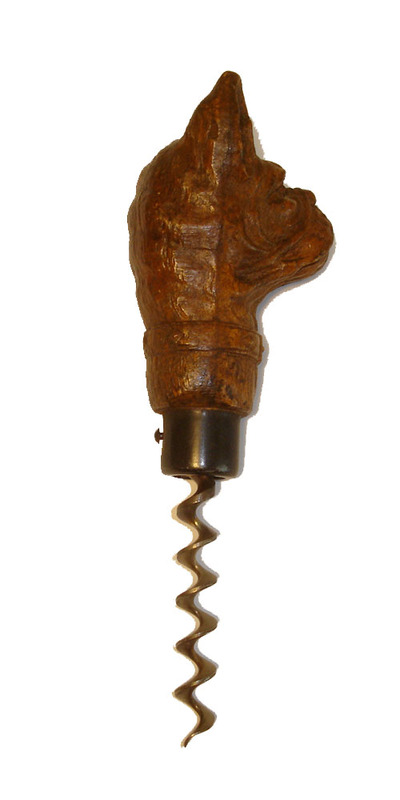 There are other Syroco corkscrews that I am still trying to find. The stained/painted/variations of paint or bell/direct pull counterparts of those pictured below are some that I am seeking. I am fascinated with this company and have tried to research the company's history. Unfortunately due to a fire at SYROCO in the 1990's, and many ownership changes, almost all of the records, old catalogs, archives, and other valuable information were lost. 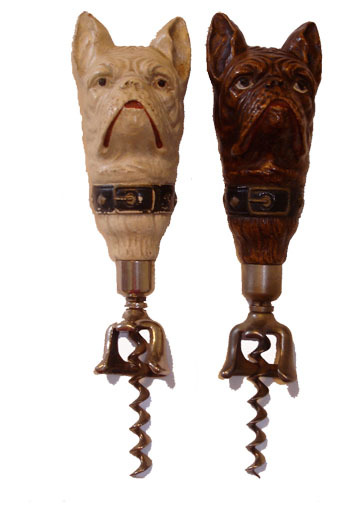 What remains are some wonderful, quirky, and brilliant corkscrews made of compressed wood flour, waxes, and resin, that keeps collectors hunting for the next piece. The Syroco Old Codger is seen in Syroco catalogs as Codger, Old Codger and Topper. He came in variations of paint colors (blue, light gray, or dark gray pants, with a hat to match). Like the waiter, the codger is found in the painted or stained version with either a wire or bladed helix--there also seems to be a variation in height on the codger...pieces may be found measuring 8 inches tall, while others are half an inch taller. 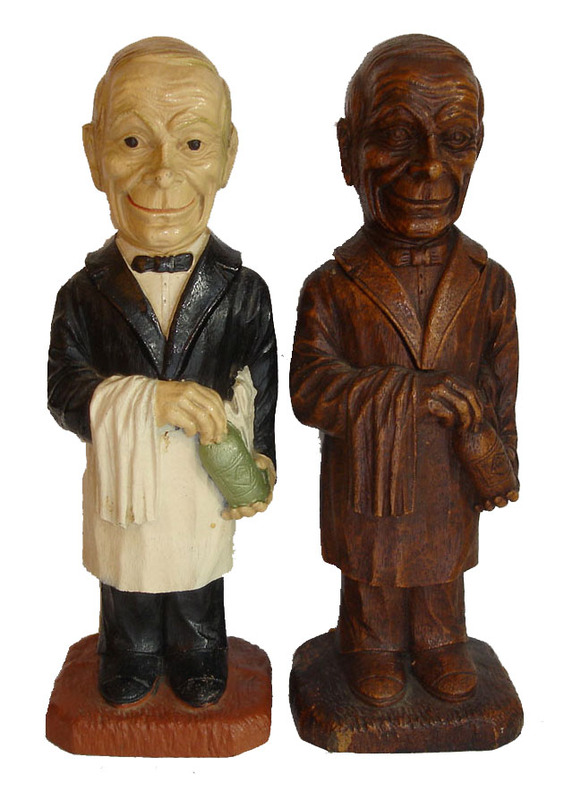 The Syroco Waiter, like the codger, seems to turn up more often than the other full figure syrocos. There are three versions of the waiter. The painted versus stained, and the painted with a wire helix instead of bladed. The bladed version is older, though they only differ by a few years. There are some variations in paint, the bottle sometimes a little more green, the base a different shade of brown. 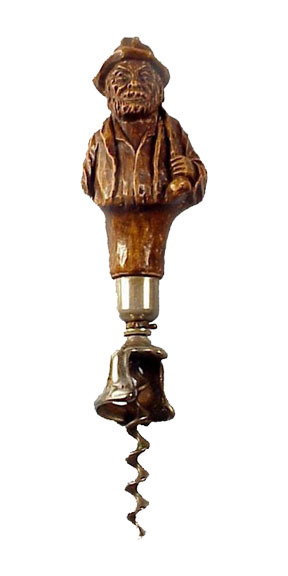 The Syroco Monk is a charming full-figured character He is seen in many variations of stain and paint. Always found with the bell assisted bladed corkscrew, he spends his time watching over the Syroco flock. 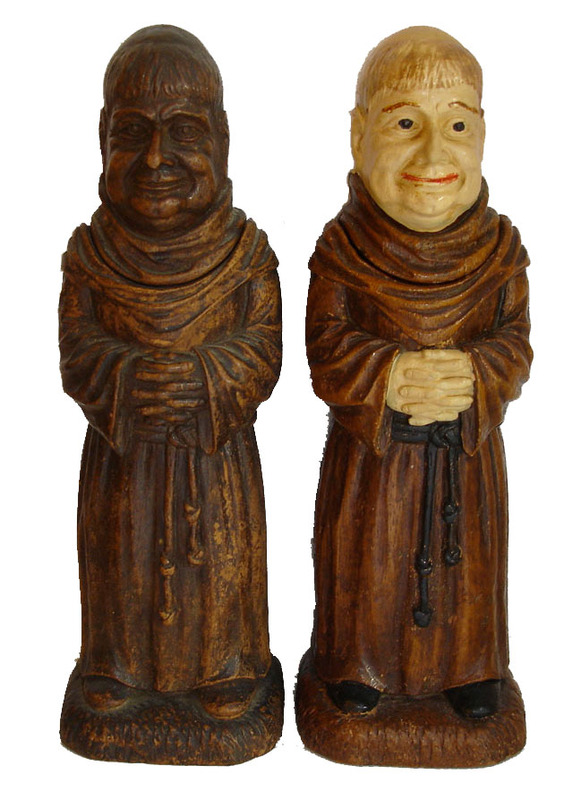 The monk on the left is the stained version of the Syroco Monk, the right is the painted version---sometimes known as "Friar Fabulous!" The Syroco Clown is a whimsical full-figured fellow. Seen in variations of stained and paint, he carries a tambourine in his hands and has a ball at his feet. 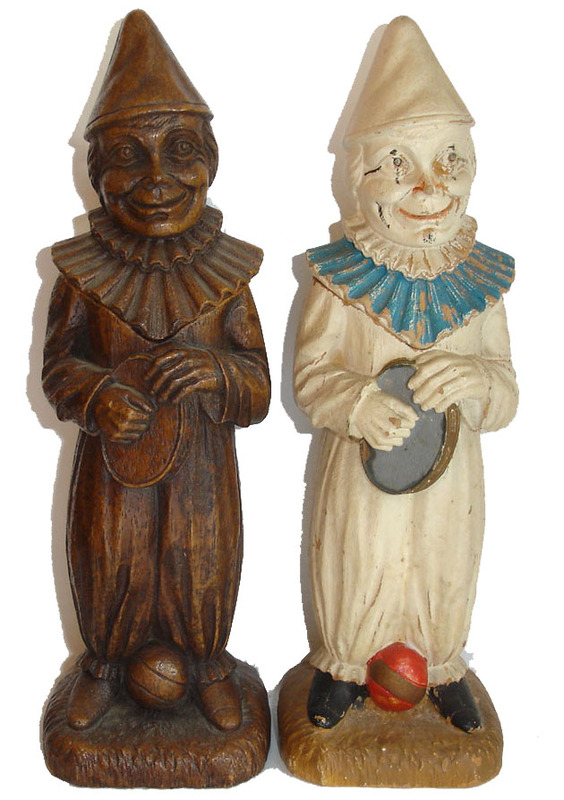 The stained clown on the left is perfect down to what I assume is the original retailer's sticker on his base which reads "Crockers, Kay Street Branch." The painted clown on the right has a "KING" label. 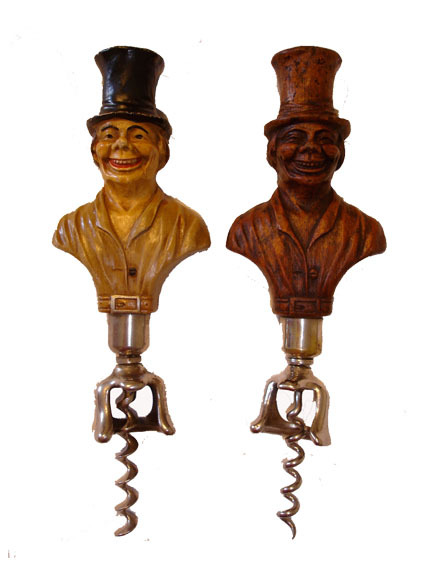 The Syroco Laughing Man is a delightful piece--without a doubt he has the most character of all the syroco corkscrews. Very appropriately named, he is seen in the old Syroco catalogs as a direct pull (no bell) and can be found in both painted and stained version as seen here. He also may turn up with a bottle opener attached. 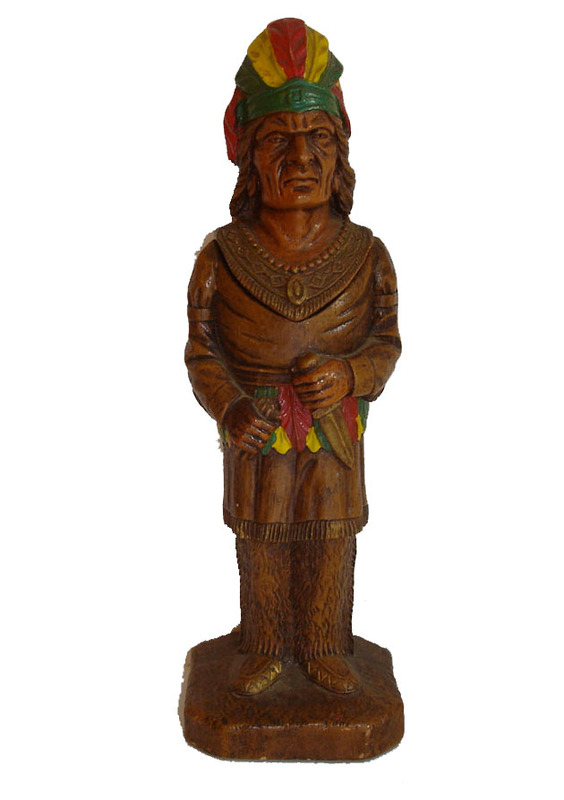 The Syroco Indian was offered in variations of paint as a full figure with a removable head, the head alone with stain only. 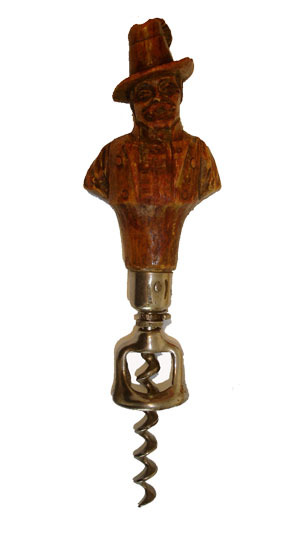 The head is also found as a bottle opener. The other variation is that the Indians came in a wider/narrower version--Chief Syroco here is the narrow version. I would love to have another Indian, especially the Chief's broader counterpart.. If you have one, drop me a line. 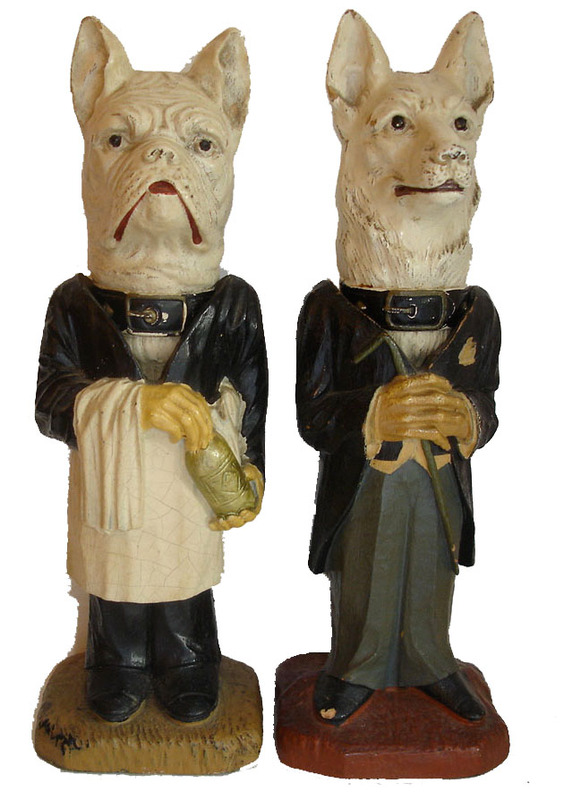 On occasion, whether on ebay, at flea markets, or the local antique store, dog heads appear on waiter or codger bodies. The combination usually seen is the German Shepherd in the Codger body, or the Boxer/Bulldog in the Waiter body--clearly Bulldogs have the dexterity and skill to work as a waiter/bartender. These pieces were never marketed through Syroco's catalogs. But, as they turn up with relative frequency, some retailer must have taken it upon themselves to create the mis-matched piece. The Syroco Pickwick is quite the character with his top hat, button nose, and slightly cocked eyebrow. He is found in two variations as you can see here; stained or painted, and with the bladed or wire helix. He has also may been found as a bottle opener. The Syroco Tramp is an interesting and hard to find piece. 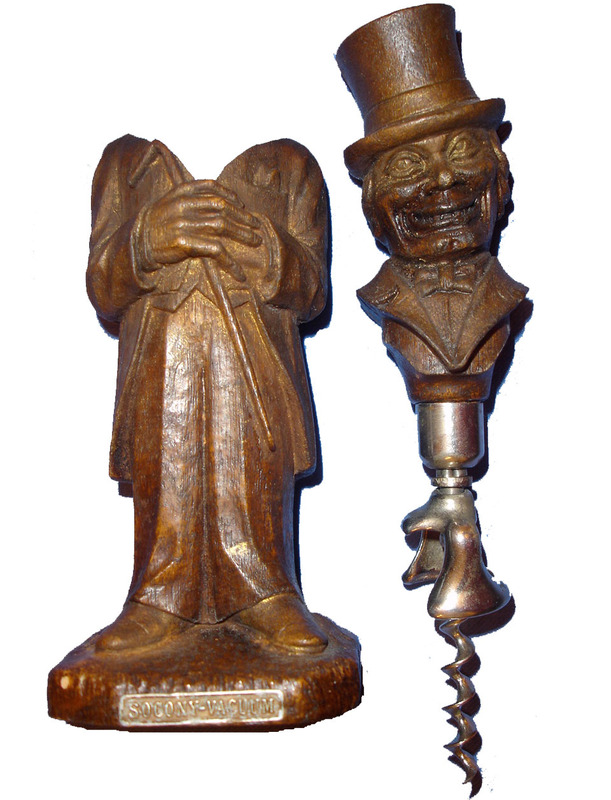 Fred O'Leary found an old Syroco catalog which featured a wood full-bodied statue (not a corkscrew) with the same features as the one with the corkscrew attached referenced as "Tramp," hence the name. The Syroco Copperfield is one of the hardest Syroco's to find. Only through some lengthy negotiations, and several trades, was I able to acquire this one. He is only found with a stained finish, and is quite the dashing young fellow. Occasionally, a Copperfield may show up with a bottle opener attached. The Country Gentleman is only found in the stained version with the bell assist. A jaunty looking chap with his feather adorned hat, he is a bit smaller than his Pickwick compatriot and is quite similar to the Tramp in style. 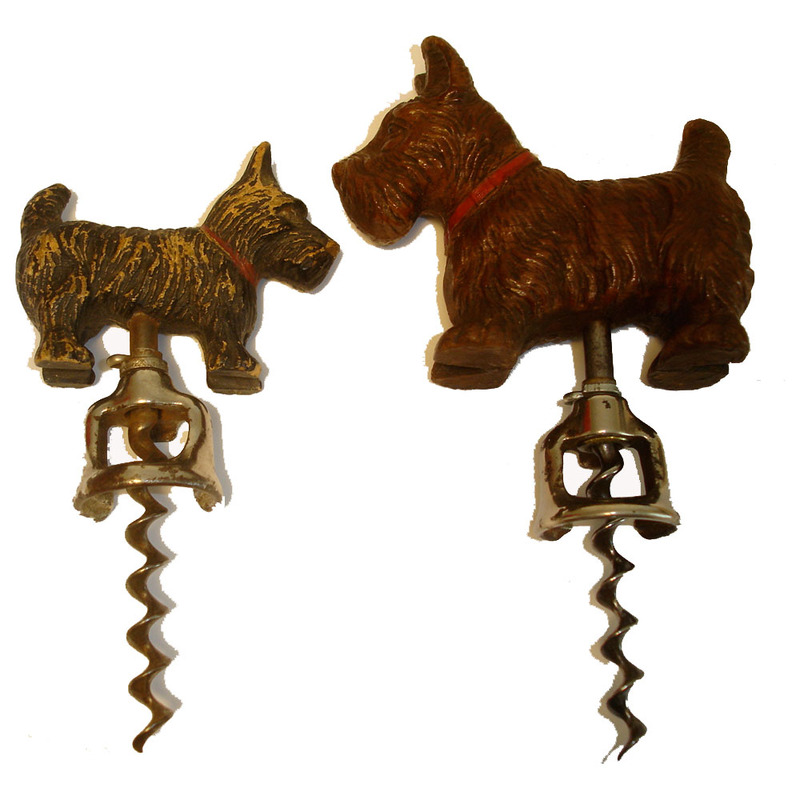 One of the harder to find Syrocos is the full figured Scottie Dog with bell assist. It seems that Syroco made these in two different sizes. The Syroco German shepherd is often referred to as the "Police Dog." He was offered in a brown, black or white version. Among those who collect Syroco there is one piece that is head and shoulders above the rest--literally and figuratively. 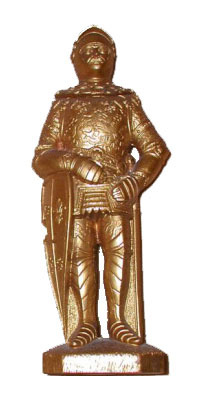 That is the "Golden Knight." I have yet to find a catalog reference for this piece, but it was made by Syroco and has their sticker on its base. It is a bit taller than the other full-figure pieces, and has a shorter worm. Small direct pull Boxer/Bulldog usually found in the with the stained finish. 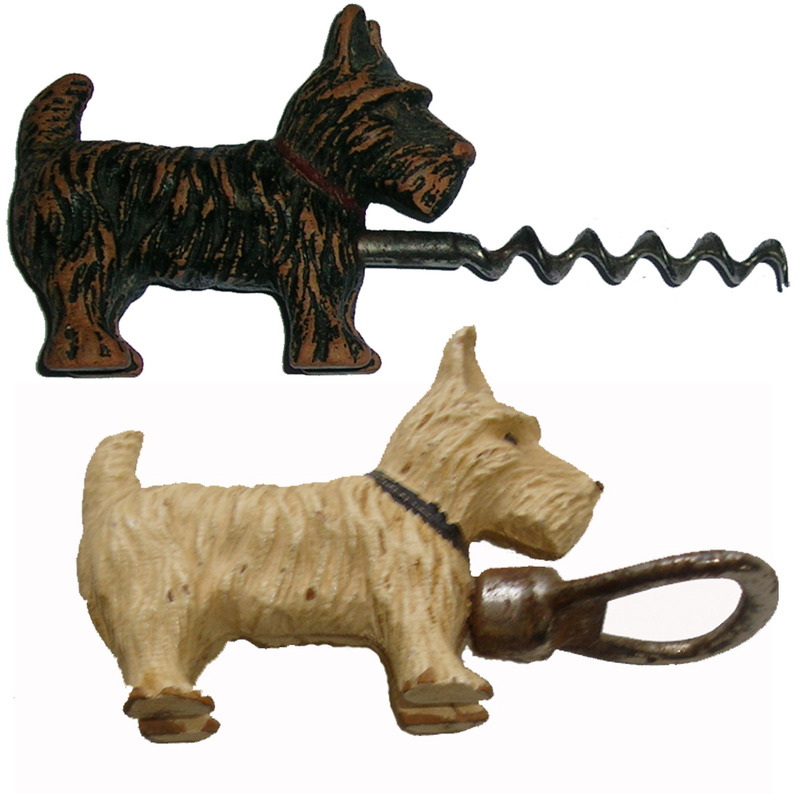 Small direct pull terrier corkscrew, found in both stained or painted versions. 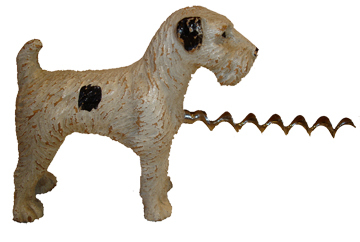 Small direct pull scotty dog; found in paint and stain. Small direct pull german shepherd / police dog; found in stained or paint. Like the mismatch pieces, every once in a while a pink/stained elephant or horse head shows up with a corkscrew attached. These are only in the catalogs as openers. 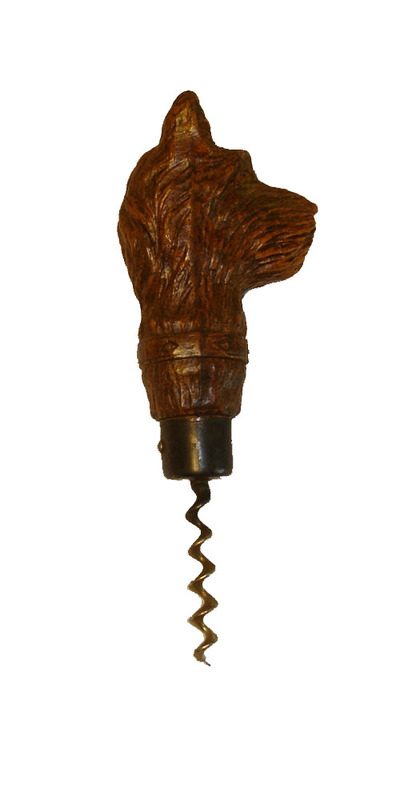 Definitely a hard to find, and delightful corkscrew. The Syroco Indian has an S incised on its base, and invariably has a sticker that reads "copyright." The Golden Knight has a similar mark. Others don't....why? Several collectors have found aluminum versions of the indian head, waiter, etc., were these experiments, prototypes? Syroco literature explains that each piece came with a gift box, yet no boxes have been seen... MYSTERY SOLVED! 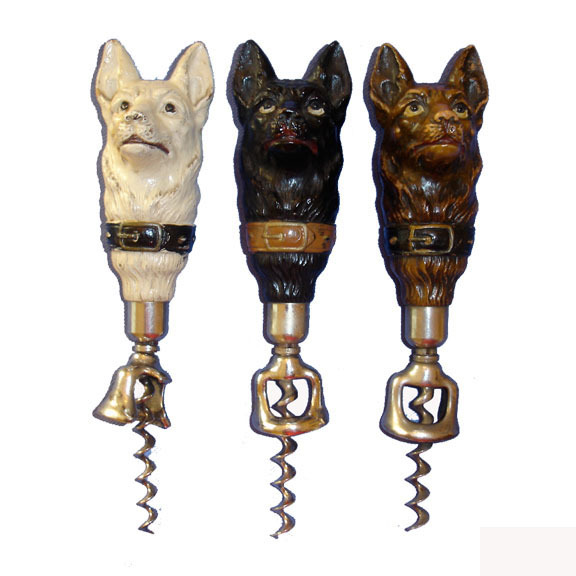 If you have a single syroco or several for sale, or catalogs that feature these items, we have a corkscrew collecting consortium that would be interested in acquiring them. Drop us a line !